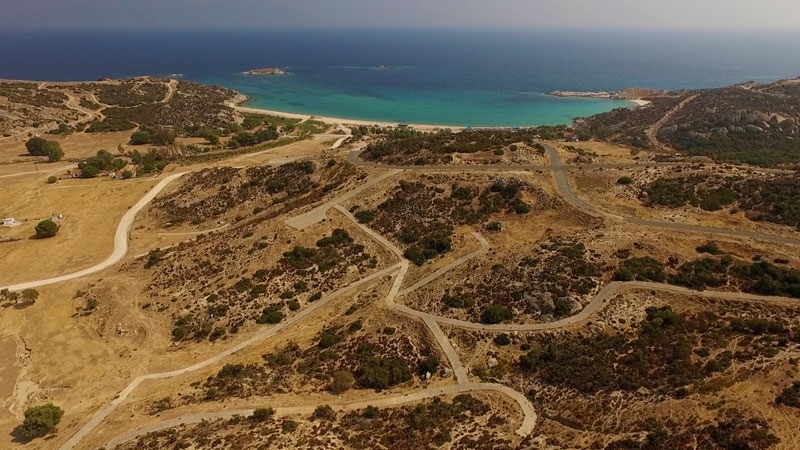 This walk starts from the bus stop on the main Sithonia road and brings you to Kriartsi beach. Not organized in any way and a campers paradise, this is truly one of Greece’s best beaches. Hike from this point on the dirt road towards the coast, it will become paved after sometime and then again turns to dirt. After sometime you come across some small bridges which you can follow on a hikers path, this is shorter than the road. You will arrive at Kriaritsi beach after 3.5 km. After arriving at the beach you can continue along the length of Kriaritsi, follow the cove south. From here you can continue to the point which will give you a gorgeous view back to the beach. It is about 700 m to the point. For a good viewpoint, now go back to where you entered the point and go up the hill for a couple of hundred meters and you have a beautiful view over the bay.